Eye cancer or cancer of the eye is among uncommon types of cancers. Eye cancer usually affects the outer parts of the eye like eyelid, which is made up of skin, muscles and nerves. If an eye cancer starts inside the eyeball then it is called intraocular cancer. 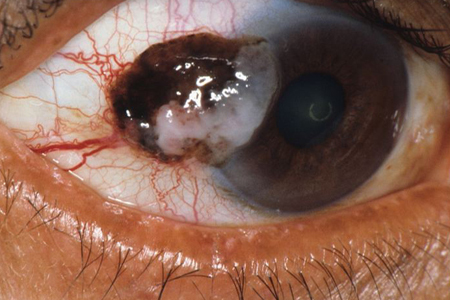 Lymphoma and melanoma falls among most common intraocular cancers. Eye cancer retinoblastoma is one of the most common eye cancers in children and usually starts in the cells of the retina creating severe eye cancer symptoms. Cancer cells can also spread to the other parts of the body. Eye cancer treatment depends on many factors. Treatment for eye cancer generally varies by the type and at which stage the eye cancer is. There are different types of eye cancers and to understand more about eye cancer it is very important to have an understanding about structure of an eye. There are two types of eye cancer. Primary intraocular cancers are cancers that usually start inside the eyeball. Melanoma is the most common primary intraocular cancer in adults which is followed by primary intraocular lymphoma. In children eye cancer retinoblastoma is the most common primary intraocular cancer. Secondary intraocular cancers are cancers that have spread to the eye from other part of the body. These cancers are not truly eye cancers but they are more common than primary intraocular cancers. Breast cancer and lung cancer are the types of cancer that spread to the eye. These cancers spread to the part of the eye called uvea.More information regarding these issues like eye cancer; special published documents of American cancer society are referred.